Remember when your mom used to tell you to clean your plate at dinner when you were a kid? Turns out, that wasn’t the best advice. 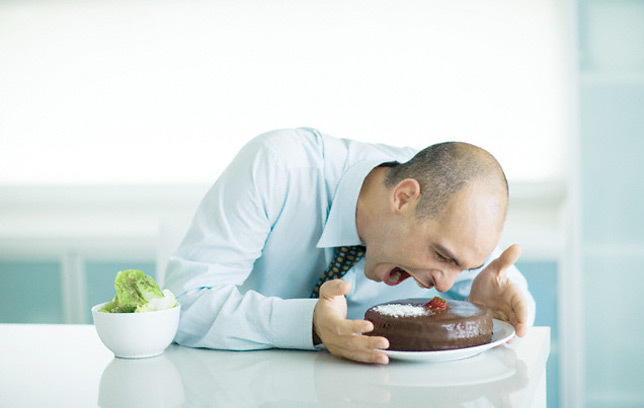 Gobbling down everything might set you up for a fatter future, a new study from England suggests. Researchers asked almost 1,000 adults about their eating habits and found that people who cleared their plates most frequently were significantly more likely to be overweight than those who left a few bites. The reason seems pretty obvious: When you eat everything on your plate, you’re taking in more calories. And when you consume more calories, you’re more likely to start packing on the pounds. Polishing your plate isn’t necessarily a problem if you put the right amount of food on it. But that’s not usually the case. In fact, a Cornell study found that people dole out 52 percent more food when they’re serving themselves on larger plates as compared to smaller ones. And that equated to 45 percent more food down their gullets. Explosive movements take a lot of energy. That's one of the reasons why squat jumps often feel so much harder than a regular bodyweight squat.